Some of the general causes of muscles cramps are stress, overuse of muscles, fatigue and dehydration. In fact, our nervous system sends wrong chemical signal to our muscles to contract. These are all the natural reasons of cramps. Use of certain medicines can cause muscle cramps at times. Although there are a number of ways for treating muscle cramps, a simple stretching of the muscles can save you from deadly cramps. What you can do to treat muscle cramps? Hydration is first step of treatment of cramps. Before you start treating your cramped muscles, you should drink water. You need to take 16-18 ounces of water before exercising. Small sips of water intake help you recover from the cramps than taking large gulps as your body finds it easy to process small sips of water. Electrolytes are nothing but the minerals like potassium, sodium and magnesium. Deficiency of these minerals can cause muscle cramps. The best source of electrolytes is banana. You can also consider several other fruits. Flow of blood is critical of cramps. Vitamin E is responsible for smooth flow of blood in your body. Generally the muscle cramps that occur in your leg are caused by the deficiency of Vitamin E. Shortage of calcium in your body can cause muscle cramps. You shouldn’t take more calcium than the prescribed levels. Before doing rigorous exercises, it is advisable for you to stretch your muscles because you can stop muscle cramps beforehand. When you experience cramps, you should stretch your muscles in such way that it is not painful at all. Thigh stretch and calf stretch are some of the commonly used stretching techniques to relax your muscles. You can use either of the two mentioned above to relax the cramped muscles. You should periodically apply any of the two with intervals. First, you should put heat pad or cloth soaked in hot water for 20 minutes. If the cramp doesn’t go with that, you need to reapply the method. Warm bath helps you to great deal when it comes to treatment of your cramped muscles. You can take bath for 10 to 15 minutes twice or thrice in week. You can simply massage you cramped muscles with the help of your hand. Massaging can be done by simply rubbing your muscles firmly with your hand. You can use vegetable oil for massage to help your muscles relax quickly. Muscle cramps are generally temporary in nature. When these occur continually, you should take help of the sports medicine with due consultation of a doctor. Generally doctors prescribe muscle relaxants for you to alleviate the pain that you go through during cramps. Apart from relaxants some of the medicines are used for treating the disordered muscles that cause muscle cramps. In the worst case scenario, you need to go for medication or physiotherapist. But, you shouldn’t ignore the prolonged muscle cramps assuming them as temporary cramps. If you’re looking at moving companies pataskala ohio to help you get onto the next phase of your life call Moyers Movers! When you have a medical issue be it a stomach ache or something more serious like opiate addiction rehab in Orange County , CA you seek out an expert in the field. Sports medicine is no different. Sports medicine focuses on treating and preventing sports-related injuries and improving the performance and movements of people. Sports medicine is not meant for athletes only, but it is useful for patients who need more effective exercise programs. This is also useful for disabled patients if they desire to expand their physical capabilities. This is a fast growing healthcare filed because the professionals who specialize in this field can help many regular people and athletes. the term gained popularity only since the late 20th century. They mainly focus on the diagnosis, prevention and treatment of injuries that occur during sports and other physical activities. Sports medicine physicians receive special training in sports medicine during a fellowship program after completing a residency program in other specialty such as orthopedic specialty or primary care. At present, no wide-spread residency programs are available in sports medicine. Sports medicine doctors who have specialization in primary care mostly complete a 3-year family medicine residency after their medical school. Then, they focus their attention on sports medicine. Sports medicine career options are very vast. The careers of some nurses, dietitians and nutritionists can also fall under sports medicine category if they focus on some aspects of sports or fitness. Some most common job titles in sports medicine include athletic trainer, sports medicine physician, physical therapist, kinesiotherapist, and exercise physiologist. Doctors of osteopathy and medical doctors deal with sports related illnesses and injuries. However, medical doctors prescribe medications, perform surgeries, and diagnose and treat patients. Doctor of Medicine (MD) degree from an accredited medical school is essential for performing these tasks. Osteopathic doctors also treat and diagnose patients, but their approaches are more holistic and they focus on the musculoskeletal system of patients. Doctor of Osteopathic Medicine degree (DO) from an accredited osteopathic medicine college is essential for them. Both types of doctors must complete a resident training successfully and they must be licensed to practice medicine. Athletic trainers are responsible for diagnosing, treating and preventing various injuries including those are related to sports. Unlike fitness specialists or personal trainers, athletic trainers are known as allied health professionals. According to the BLS, an athletic trainer has at least a bachelor degree. However, they can earn a master’s or even a doctoral degree. Athletic trainers must be registered and licensed to work in almost every state. Physical therapists are responsible for treating and diagnosing patients who face a variety of physical challenges, including disabilities or sports related injuries. They help restoring mobility and function to injured limbs or other body parts, relieving pain, limit or prevent effects of disabilities caused by a disease or accident. A post graduate degree in physical therapy from an accredited school is essential for entering in this career. In order to practice in the US, physical therapists must have a license. These professionals also focus on health benefits of exercise. Kinesiotherapists develop and supervise exercise programs for patients. These programs are helpful for them to regain their mobility and strength after an illness or injury. They develop therapeutic exercise plans, including aquatic exercise. Kinesiotherapists can gain certification as RKT (Registered Kinesiotherapy) through AKA (American Kinesiotherapist Association). Exercise physiologists help patients to improve and maintain their physical fitness. These professionals focus on cardiovascular system and they help rehabilitate patients who suffer from heart problems and other chronic diseases. Exercise physiologists develop exercise plans as per individual needs and they offer sports counseling and sports training guidance. A degree in exercise physiology from an accredited school is essential for becoming an exercise physiologist. The American Society of Exercise physiologists issues board certification to these professionals. The ACSM (American College of Sports Medicine) offers sports medicine specialty certifications such as HFS (Certified Health Fitness Specialist) and CPT (Certified Personal Trainer). The ACSM also provides clinical certifications for physiologists and exercise specialists as well as certification for exercise specialists who treat people with disabilities and cancer. As per the latest evaluation, sports medicine field is booming rapidly. Lots of medical schools offer more and more sports science and sports medicine curriculum. Western society has started recognizing the dangers of physical activities. They are making significant efforts within public health community to make people more physically active. So sports medicine has greater importance. Sports medicine is one of the reputable medical fields with many employment opportunities in different establishments ranging from schools to hospitals, sports clubs and even outcall self-employment. This is why there are many schools that offer the training in the USA and finding one should not be a problem. However, not all schools are renowned for sports medicine. Some institutions have better facilities and course modules than others and their accreditation is considered estimable or more valuable. It is therefore important to find such training institutions if you are considering a competitive edge in your career. Here are some of the best schools to study sports medicine in the USA but first, a brief distinction of attributes that hallmark best training centers for the course. Facility and equipment – Like most medical fields, training requires adequate resources and space for comprehensive training, research, laboratory testing and examination. A good sports medicine school should have a fully equipped facility with spacious laboratories that adequately serve the enrolled population. This should be characterized by modern technology and upgrade in accordance with standards and emerging trends. Course module and delivery – Different institutions offer different course modules while some offer all the variant modules. The best schools will have offers for certificate, diploma, degree, masters and even PhD and doctorate levels. They should also feature various majors and specialized fields for advanced high-level training. Examination, testing and accreditation – The level of examination and types of accreditation given also play a big role when looking for the best school to learn sports medicine in the USA. Best schools offer high-end examination and testing. Their graduates are fit for employment in any industry and have sufficient knowledge and experience to handle the tasks at hand. Certificate reputation and employment – Although many pursue careers such as sports medicine to be able to make a change in someone’s life, the ultimate goal is to get good employment and a comfortable salary. While the career is one of those that pay high wages, there are various categories within the range. The best schools offer reputable accreditation that will not only get you a job soon after graduation but also puts you in a position to earn higher since your training is considered more expansive and reliable. There are many other minor characteristics of best sports medicine schools including experience, research and library, networking and affordability. hierarchically ranked from the top best according to recent expert reviews. Ohio State University (Ohio 43210) – located in 154 W on the 12th Avenue of Columbus. They are the first ranked school for sports medicine and have the best facility and training. University of South Florida (FL 33620) – located 4202 E on Flower Avenue in Tampa. They come second for esteemed accreditation, variety and high-end course modules. University of Michigan (MI 48109-5239) – the course is delivered at the Sports Medicine Fellowship department of family medicine located 1500 E on Medical Center Drive. They are renowned for top-class facility, research and training. University of California (CA 90095-1683) – found in 10833 on Le Conte Avenue and 50-080 CHS in Los Angeles. They are renowned for reputable accreditation, top-class training facility and wide resource center. Boston University – found in Boston Massachusetts and popular for exceptional networking, large resource center and high-end examination. There are many other exceptional schools where you can learn sports medicine in the USA. Some of the names that did not make it to the top 5 list but are still reputable training centers include University of Pittsburg, University of Virginia, Missouri Stat University and University of Colorado (Colorado Springs). Others are University School of Medicine Stanford University, Utah State University, University of Miami, Brown University, Quinnipiac University and Norwich University. Most state universities offer department/school of medicine within which sports medicine are trained. The number of reliable schools that offer this course in the USA is quite high especially since the course modules of such sciences are often upgraded for all institutions. The only differences are in research, networking and facility. Texas Online Defensive Driving School specializes in teaching people skills for defensive driving. Their courses are 100% Texas approved and they will deliver your certificate in 2-3 days so you can be the best at texas defensive driving. A concussion is a form of traumatic brain injury resulting from a blow, or a bump, or a jolt to the head that makes the head and brain to move swiftly back and forth. A concussion may also result from a hit to the body. The sudden movement of the head and brain causes the brain to twist or bounce around in the brain, thus, stretching and damaging the brain cells. This movement can create chemical changes in the brain. Concussions should not be taken lightly. Though they are not, alone, life-threatening, they can have effects that are grave. Due to the chemical changes that may result, concussions may cause victims to become unconscious. Though anybody can become a victim due to a fall, car accident, etc., concussions are more likely to affect people who participate in contact or impact sports such as boxing or football. The signs and symptoms of a concussion are sometimes subtle and may not manifest immediately. The symptoms can last stay for a couple of days, weeks, or even longer. The symptoms of a concussion vary depending on both the person injured and the severity of the injury. While some people experience a loss of consciousness, it is not always true that a loss of consciousness always accompanies a concussion. The signs and symptoms of a concussion usually include headache or feeling pressure in the head, confusion or feeling like he you are in a fog. 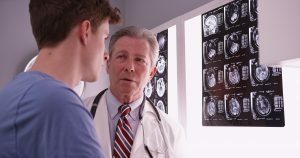 Patients experience temporary loss of consciousness, amnesia- where patients often forget the cause of the concussion. They may also suffer from ringing in the ears, dizziness, nausea, slurred speech, appearing dazed, delayed response to questions, vomiting etc. While some of the symptoms of concussions can be immediate, others are delayed in onset by up to days after injury. The symptoms that may be delayed include sensitivity to light and noise, irritability and some personality changes, concentration and memory complaints, disorders of smell and taste, psychological problems and depression and sleep disturbances. The treatment for a concussion usually depends on the severity of the symptoms you experience. Where there is bleeding in the brain, swelling of the brain, or serious injury to the brain, you might need surgery. Save for that, most concussions do not require surgery or major treatment. For the first twenty four hours after the injury, the doctor may require someone to wake you up every two to three hours. This is a way to ensure you do not drift into a coma as well as allowing the person waking you to check for any signs of severe confusion or any other abnormal behavior. Just in case the concussion is causing headaches, the physician may recommend some over-the-counter pain relievers such as acetaminophen (Tylenol), ibuprofen (Advil). The doctor will likely ask you to get enough rest, avoid strenuous activities and sports, and avoid driving automobiles or riding bikes for 24 hours or for some few months, according to the severity of the injury. You should also avoid alcohol as it might slow recovery if you continue drinking it. Most importantly, do not embark on strenuous or impact sport until full recuperation and at the advice of your physician. We are extremely grateful to our sponsors – places like the fantastic nerve pain treatment centers at QC Kinetix– for helping us get our blog going. Athletes undergo a lot of grueling torture with their bodies due to the intensity of the sports they are in. It is no wonder so many athletes try different medicines in order to help their body recover. In this article I will cover alternative medicines athletes use and why they might use such medicines to help relieve the problems they suffer. First of all, what exactly is considered alternative medicine. Alternative medicine is known as medicine which is not considered to be part of conventional medicine, i.e. not practiced by any doctor. That is not to say that these alternative medicines don’t work, that is just to point out that these alternative methods may help athletes relieve their pain, or in some cases increase their endurance, but are not exactly practiced by any doctor. Two of the most popular alternative medicines for athletes are acupuncture and massage. Where traditional medicine would treat aches and pains by medicine, these athletes try and solve their problem by other means. Other forms of alternative medicine include yoga, meditation, herbal medicines, and of course, the all too well known performance enhancing drugs. First, we will discuss acupuncture and massage. These two alternative medicines attempt to help aches and pains in different ways. For instance acupuncture involves the use of needles to target well known pressure spots, in order to relieve tension in the muscles. Massage works roughly in the same way, except instead of using needles to relieve tension in the muscles, a massage therapist attempts to relieve stress in the muscles by massaging them. Just as an acupuncturist knows which spots to hit in order to relieve pressure, a massage therapist knows which muscles to rub in order to relieve tension. When it comes to yoga and meditation, these two alternative medicines attempt to to aid the mind in relieving stress in the body. Yoga is a combination of stretching and breathing that attempts to help the mind relieve the body of its pressures. Meditation in the same way tries to aid the mind in healing the body. Both of these alternative medicines can be thought of as medicines which strive to stress the idea of mind over body. Finally we get to the subject of biological based alternative medicines. These medicines try and heal the body using herbs and different chemical substances. When it comes to athletes, the most common biological based medicines would be: creatine products, protein, and of course ephedrine, which is a performing enhancing drug. When an athlete uses these chemicals, they are trying to make the body stronger. By making their muscles stronger, athletes gain endurance, strength, and skill. Some medicines also increase the ability to handle pain. Of course, in recent years, drugs such as ephedrine have come into the spotlight, as they are now banned in most major sports, and incur heavy fines if an athlete tests positive. Of course not all alternative medicines are bad. In the case of Performance Enhancing Drugs, they are known to have very problematic side effect. This is the main reason why they have been banned. They may help the athlete in the short run, but long term use will cause great harm to the user. To end this article I would like to discuss the usefulness and effectiveness of some of the alternative medicine techniques listed in this article. To begin with massage, such as the sports massage, has shown to be very effective when dealing with aches and pains. It has shown the ability to help athletes recover from fatigue and nagging injuries. Acupuncture has also shown the ability to manage pain as well as speed up recovery from injury. Many professional athletes are combining both massage and acupuncture to help them deal with their problems. When it comes to yoga and meditation, many athletes are trying these alternative medicines. Both have been known to increase energy as well as relieve stress and restore health. When it comes to professional sports, the one thing all athletes need is energy. Finally, when it comes to chemical substances, one popular way that athletes stay in shape and ward of illness is aromatherapy. Aromatherapy is the practice of using plant oils in aiding recovery from sport injuries. There are more than a hundred different natural oils that have show to have antiseptic, pain-relieving, and even antidepressant effects on the user. Many athletes are using such oils because it helps them heal their injuries as well as help increase their fitness levels. Thanks to the fantastic Plumber Layton Utah for their support of our site! We’re going to start off with a few posts about sports medicine. While this doesn’t really fall under the category of “home treatment options” it is some great information to know if you play sports or if you are looking at becoming a sports medicine practitioner.